The Thermal Wave by SUNHEAT TW1500 electric portable infrared heater is designed for those looking for a quality heater at an affordable price. The TW1500 model is housed in an elegant all wood cabinet featuring a rich and modern cherry finish. Thermal Wave infrared heaters provide comfortable and economical heat for any area of your home. This practical and stylish heater has two heat settings (Hi and Lo), remote control, and digital thermostat with LED display and temperature control. Designed to be a safe supplemental heat source, it will effectively warm up to 1,000 sq. ft. with soft infrared heat. Thermal Wave heaters utilize six quartz infrared heat tubes that emit no harmful emissions. This heater cannot start a fire and is safe around children and pets. It comes equipped with heavy duty rubber casters that allow you to easily roll the unit from room to room. This reliable heater carries a three (3) year parts and labor warranty. You will quickly recover your investment, often in less than one heating season, simply by turning down the furnace, putting the heat where you need it and lowering your heating costs. 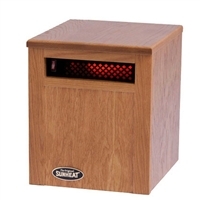 The Original SUNHEAT 750 watt electric portable infrared heater with Made in USA Cabinetry provides safe, soft, comfortable heat for any room in your home. 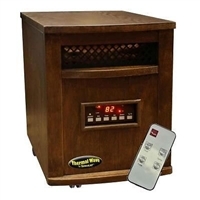 The SUNHEAT model SH-750 is a room size heater designed to heat up to 500 sq. ft., perfect for bedrooms, small offices, or shops. This smaller size heater works best when elevated off the floor; on a desk, countertop or TV stand. A cured copper cylinder and heat deflector offer substantial storage capacity for the infrared heat produced by three 250 watt commercial grade quartz heat tubes. These core elements, combined with a high velocity fan and a lifetime washable filter, produce a heat output of room temperature plus 100˚F. This relatively low but highly efficient output allows the infrared heat to be absorbed by the moisture in the air as it’s pulled into the heat chamber. The warm moist air then flows out of the heater and transfers soft infrared warmth to the people and objects in the room. The result is comfortable radiant heating, floor to ceiling and wall to wall. The all wood cabinetry stays cool to the touch and safety touch fabric cover the heat register for added safety. A set and forget thermostat allows the unit to cycle on and off as needed to evenly warm with no harmful emissions. This reliable infrared heater comes with a 3 years parts and labor warranty, cannot start a fire, is safe to operate anywhere, all the time, even around children and pets, but best of all it will slash your heating costs. 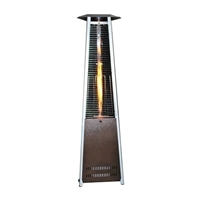 The Original SUNHEAT patio heater features a contemporary triangle design and a decorative variable flame to heat up any outdoor gathering. The unique triangle stance and pyramid shape provides functionality and style that will warm and accentuate your patio or deck. The inviting flame will safely light up the night as it dances inside a four foot tall quartz glass tube. The 23 inch triangle reflector hood evenly spreads the 40,000 BTU’s of heat across your outdoor space, up to 12 foot in diameter. You can adjust the flame and the heat output by simply turning the temperature control knob which is located behind the front panel. The push button ignition system makes this unit simple and safe to operate. It will run up to 10 hours on the highest setting. The PHTRGH model comes with a one year warranty. Whether it’s a family gathering or a business party The Original SUNHEAT patio heater will add warmth and style to any occasion. • Heats up to 1,000 sq. ft.
•Cabinet all the time, even around children and pets. Best of all, the USA 1500 will slash your heating costs. Full Spectrum Near Infrared Heaters sold as a pair for GDI-8 Series Edition. S-Shape Backrest Set of 2. An internal control systems has the blower mounted inside the spa wall, making this spa a lot quieter to use due to the insulation provided by both the spa construction and the water inside it. MSpa comes with an integrated control panel and a patented built-in control box designed for easy use: easy to set up, easy to inflate, and easy to drain. To use the smart inflation: connect the both ends of the pipe and press the BUBBLE button; inflation will be done in less than 5 minutes. Integrated self-drainage system avoids having to bale out. The 1.5 Kw heater has a maximum heated water temperature of 104 degrees Fahrenheit (heats about 1.5-2 degrees/hour on average). Top cover with foil inside to prevent heat loss. Buckle lid with ground mat set. Top cover with foil inside to prevent heat loss. Buckle top lid and ground mat set.